Our salon division, launched January 1, 2019! It’s a passionate team of hair and make up artists specializing in bridal and formal styling. Their team works exclusively in the Lounge, which is a gorgeous setting to bring your bridal party together to get your hair and make up done. With beautiful styling stations, elegant furnishings and a spacious dressing room, they are able to accommodate bridal and grad groups of all sizes. TDL Styles pride themselves in cultivating relationships with their guests that allows them to create exactly what you are looking for. Personalized touches such as a glass of bubbly with your complimentary in-studio consultation, allow you to unwind and relax while you discuss your wedding, graduation or special event vision. The Lounge is the perfect environment to have your free, in-house consultation, and is also available to rent out on an hourly basis. Bringing your entire bride tribe and closest family members to celebrate getting ready for your big day, makes the experience much more magical! Your photographer can easily capture your most precious moments in a beautiful setting! 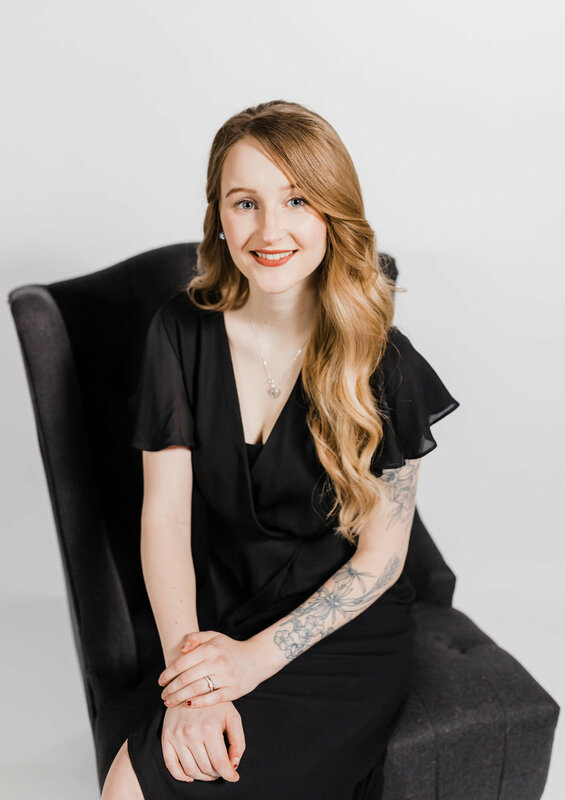 Kaitlyn Wilson leads the team with this new service and is a graduate of Eveline Charles Academy who has a passion for the beauty industry, with bridal and formal hair designs being her specialty. She has created a specialized team of talented hair and make up artists who will help transform you and your party with services including intricate bridal and graduation up-styling. Kaitlyn’s team will also be specializing in various forms and lengths of extensions, using only the finest quality products available. The makeup artists will be providing lashes and customized looks that will provide confidence for your special day. Kaitlyn graduated from Eveline Charles Academy Hairstyling & Barbering program. It was there that she discovered her passion for bridal upstyling. While still attending school, she competed live at the ABA Long Hair Bridal Competition as well as hosted live, on stage updo demonstrations at Edmonton K-Days. You will also find Kaitlyn working at The Dress Lounge as a bridal consultant. Her love for the wedding industry isn't limited to only hairstyling. She is passionate about executing her clients desired styles and giving them the highest level of personalized customer service. Fun fact about Kaitlyn: She has 4 rescue dogs and she and her husband welcomed their first child, a baby girl, in December 2018. Deena studied Hair at Spartan Hair Academy, and has had a passion for hair since she was just thirteen years old! She is also the current Technical Assistant in the Cosmetology Lab at Archbishop O'Leary High School. Deena's passion for the industry also brought her the opportunity to be a Skills Canada Alberta coach for the classroom. Not only is she an instructor but she also competes! She was a contender at both Skills Canada and the ABA Hair Show. When you meet Deena you will find that she is extremely friendly, always singing and loves to share a joke or two! She specializes in both bridal & graduation hair and is constantly looking to learn about new styles and trends in the beauty industry. Christina has been freelancing for 7 years. She attended the Numa international institute of makeup and design in Edmonton 2013 and became certified in the Essential Makeup Artist course. The reason she loves working in the beauty industry is being able to help clients on any special occasion, making them feel beautiful and confident. Seeing them smile with the after look is one of the best feelings. Makeup is her passion and she loves being able to help achieve a desired look for the client. Specializing in wedding, glam and everyday makeup looks, Christina stays up to date with trends to give her clients their desired look. Fun fact about Christina: She has an obsession with alpacas, unicorns and cats. Most gifts given to her are based on one of them! April has been in the fashion and beauty industry for over 10 years. She received her Makeup Artistry certificate through MC College and her Fashion Design diploma through the Art Institute of Vancouver. April has always loved the beauty industry and enjoys making others feel confident and good about themselves. She loves enhancing people’s beauty and making them feel comfortable and important for their special day. April specializes in natural makeup, bridal, grad, television and personal freelance services. Fun fact: April loves kickboxing and is obsessed with animals. She loves attending fashion shows and keeping up to date in the fashion and beauty industry. Mikaela has been freelancing for about 6 years. She received her certification from the Alberta Academy of Aesthetics 2 years ago. She absolutely loves bridal and being able to make anyone feel like the best version of themselves. She loves the final reveal moments when brides get to see themselves with their hair and makeup done, the smiles that come across their face, you always know they feel like the most beautiful woman in the world. Mikaela finds the industry interesting, as it's always changing. Trends change every year, but theres always staple looks to them. Fun fact about Mikaela: She practically has a zoo at home with all of her pets and moved here from the east coast a few years ago. PLEASE SUBMIT THIS BOOKING FORM AND WE WILL CONTACT YOU SHORTLY TO BOOK YOUR APPOINTMENT! Any info you'd like us to know before we contact you?